In every language there are always some unique words that convey highly expressive notions about food and cultural nuances all at once. In the Malay language, rojak fulfills this down to a T. Blessed with an abundance of tropical fruits and vegetables, Malaysians often take a variety of ingredients and mix them together into a tasty salad called Rojak. In the mind of the locals, rojak has taken upon the meaning of diverse elements and even polar opposites being blended together. As such to describe anything as rojak is to imply a jumbled mix. The cut-fruit stall is a popular lunch time fixture where Rojak can sometimes be found. The vendor will chop up his fruits and mix it with the sweet and spicy sauce. 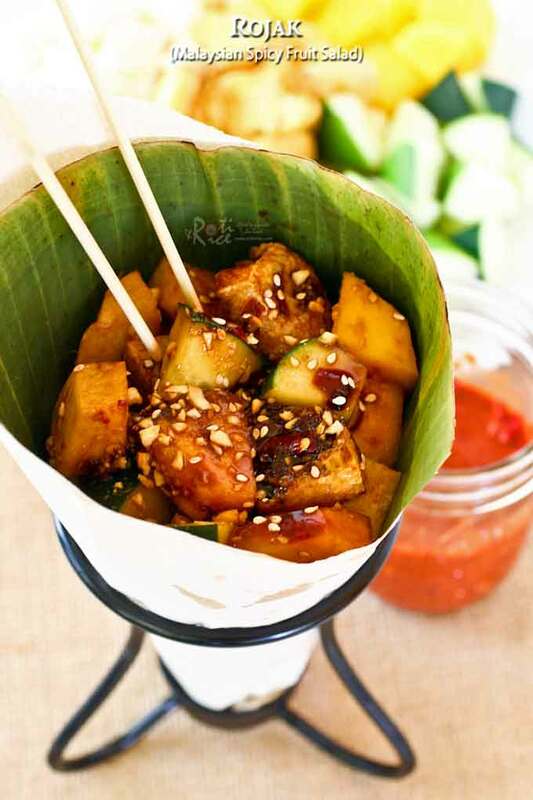 Prior to the advent of plastic bags, it was once common for Rojak to be served up in a newsprint cone lined with banana leaves. A few bamboo skewers were included for spearing the pieces of fruit. This is the most basic form of Rojak. Specialized Rojak vendors have more elaborate ingredients that include fried tofu and crispy shrimp fritters to provide a contrast of textures and flavors. The sweet and spicy sauce is what makes the fruit salad a Rojak. One can almost describe the taste as umami. The ingredients include Sambal Belacan (pounded shrimp paste and chili condiment), hei ko (sweet shrimp paste), sweet sauce, caramel soy sauce, and sugar. 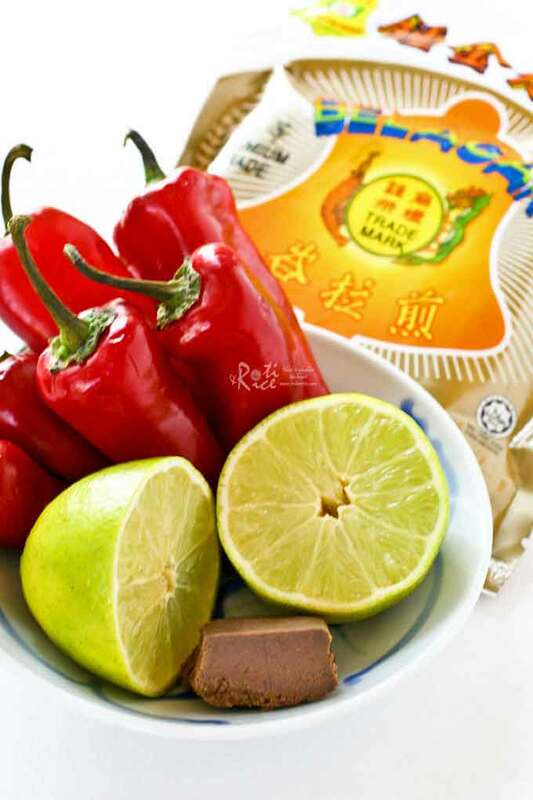 Hei ko is a very important ingredient, without which it will not have that thick caramel consistency. On this side of the world, it would be similar to a spicy chocolate sauce or mole. In fact, I made a Spicy Chocolate Rojak sometime back using extra dark chocolate as a substitute. 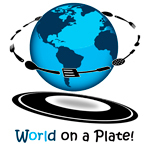 Today is the last Sunday of the month and it is time for World on a Plate. This month’s theme “Fruity Dessert” was agreed upon way back in May and the first thing that came to my mind was Rojak. I was really excited as I knew I would be able to get hei ko this time since I had a scheduled visit to Malaysia in June. Although I have not seen hei ko being sold here in my neighborhood in recent times, it is available in the larger Asian grocery stores downtown and especially the ones on both coasts. I have purchased it once or twice in the past. The other very important ingredient in Rojak is Sambal Belacan, a beloved pounded chili condiment of the Nyonyas and Malays. Many such household find food bland where sambal belacan is not present. It is often served during a meal with some raw vegetables known as ulam or simply used as a dip for a myriad of dishes. There are basically only three ingredients in Sambal Belacan – red chilies, toasted belacan (shrimp paste), and lime juice. Belacan is a cake-like shrimp paste that must be cooked and cannot be eaten raw. Always buy the best grade you can afford as a little goes a long way. Hei ko on the other hand, is a more sauce-like shrimp paste that can be eaten right out of the jar. Sambal Belacan can be prepared ahead of time and kept in the refrigerator until needed. It is best consumed within 2 to 3 days. Please scroll down for the recipe at the end of this page. Fry tofu on a non-stick pan on all sides to crisp it up. Remove and slice thinly when cool enough to handle. Set aside. Place sliced tofu, pineapple, mango, jicama, and cucumber in a large bowl. Dish into 4 individual portions. Sprinkle some chopped peanuts and sesame seeds over each portion. The chopped roasted peanuts and sesame seeds provide additional texture and crunch. This salad truly is a mix of flavors and textures unlike any other. It is spicy, sweet, salty, tangy, soft, and crunchy. I hope you will give it a try. 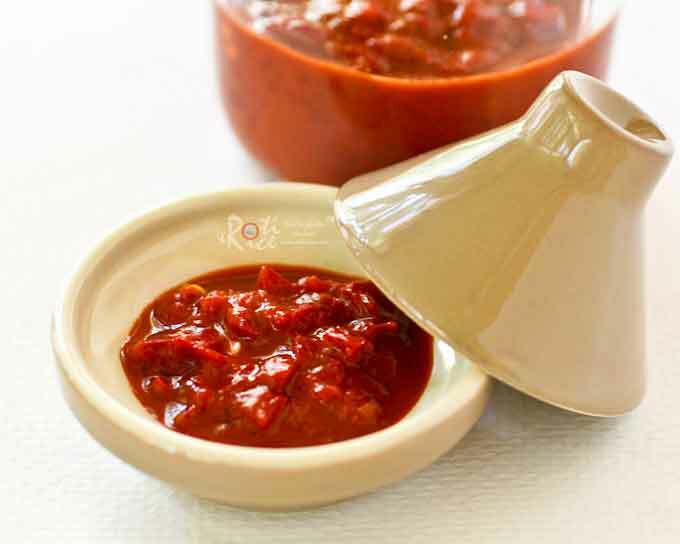 Sambal Belacan is a spicy Malaysian condiment. Toast belacan in a non-stick pan until crumbly. This will take about 3 to 5 minutes. Remove and allow to cool . Break red chilies into smaller pieces shaking off seeds as much as possible. Place toasted belacan and chilies in a small food processor and processed until desired level of fineness. Alternatively, belacan and chilies may be pounded in a stone mortar and pestle to the desired level of fineness. Transfer to a jar. Squeeze in lime juice. Store in the refrigerator and consume within 2 to 3 days. Fantastic clicks.Salad looks delicious. This is perfect entry to Flavours of Malaysia, inviting you to link it. This looks amazing! I would love to try it!!! I’m very intrigued by the flavor combination! Looks amazing! Would love the sweet and salty combination here. YUM! This reminds me of the other rojak which I really love, I am not sure if you know what I mean but the one I am saying is the sweet, salty and spicy variant, I am not sure whats on it but its not fruits. Do you have a recipe of that one? 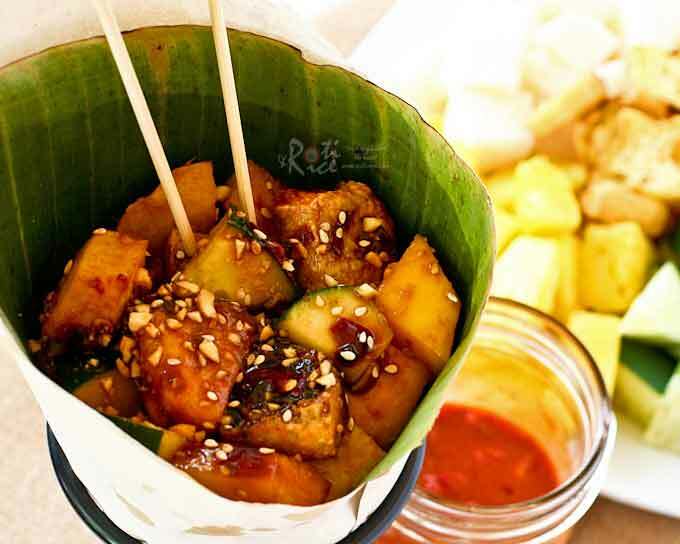 This rojak also has the sweet, salty, and spicy flavors. Perhaps you are referring to Indian rojak or pasembor. Biren, have you anything in house that needs to be done? Like laundry, car-washing, dog-walking? I will work for getting a portion of this delicious Rojak! 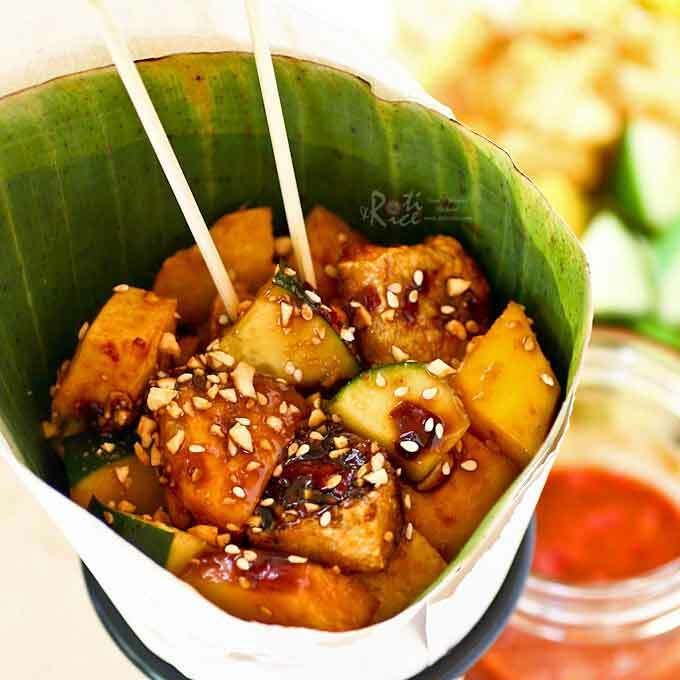 Thanks for the easy version of the rojak.My mouth waters when I see the pictures.Pineapples,mangoes,and jicama cost cheaper in summer.Plus with home grown cucumbers and chilli peppers – the rojak will taste heavenly.I will try making it next week and let you know th result. Wow…homegrown cucumbers and chili peppers! That is great! I can’t wait to hear how yours turned out. 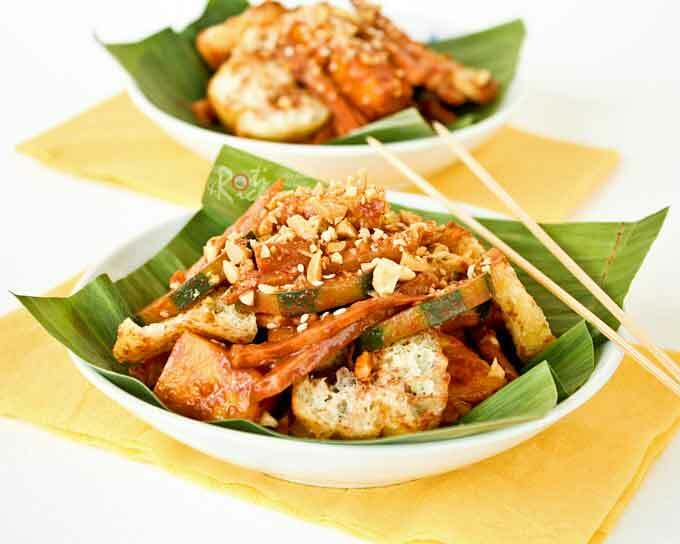 You managed to introduce the simple rojak in such a grand way with your beautiful photos! This has got to be one of the most interesting desserts I’ve ever seen! Tofu, fruit, hot sauce – in a dessert? Why not? I do love the sweet and spicy so I’m sure this is the perfect dessert for me. The sambal belacan looks very interesting and like something that could be used in a variety of dishes. I’ve never heard of belacan, so it’s now on my list of things to find! Great dessert, wonderful pictures! Thanks for sharing this unique Malaysian dessert! This truly is a jumble or mixed up fruit salad with a combination of flavors and textures. I hope you get to try it one of these days. You should be able to find belacan at the Asian grocery stores. Do buy the best grade you can find as a little goes a long way. My kind of fruit salad…wow! This looks incredible Biren! okay this is definitely new to me and I love it! I never thought to have a spicy fruit salad but I can see how amazing it would be. Love the spices! Thanks Denise! I am really loving that new macro lens as the pictures come out nice and crisp. Wow! These flavours are fantastic! I am definitely giving this a try! This is a new dish to me – and it looks great. Love the flavors. Really like your stone mortar and pestle, too. I have a marble one, but I also need a stone one (I’m crazed I know). Good post – thanks. I’m so behind Biren! I love your spin on fruit for this challenge! The combination of the sweet fruit and spicy flavor really sounds great. Sorry fr being so late for the party but I was on vacations. This is such an exotic salad! I love the flavors in this. So unique and tasty! 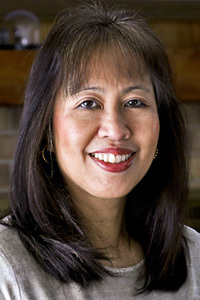 Thanks for sharing all you authentic Malaysian recipes. Love it! Just noticed that the “save recipe” box for Rojak goes to Sambal belachan. My website is always open. Please visit any time. 🙂 Really? It must be taking the first recipe on the page. I will look into it soon. Thanks for letting me know. Made the rojak last night. Tasted fine to me but I never had it before..will test it tonight at a dinner party with friends from Malaysia. I hope your Malaysian friends like it. 🙂 were you able to get the shrimp paste (belacan) and sweet black shrimp paste (hei koh)? Oh yummm Biren !!! Thanks! Is there a substitute for bangkwang? The closest thing I can think of in texture to bangkwang are Asian pears. 🙂 You can certainly leave it out altogether since there are quite a few fruits in there.